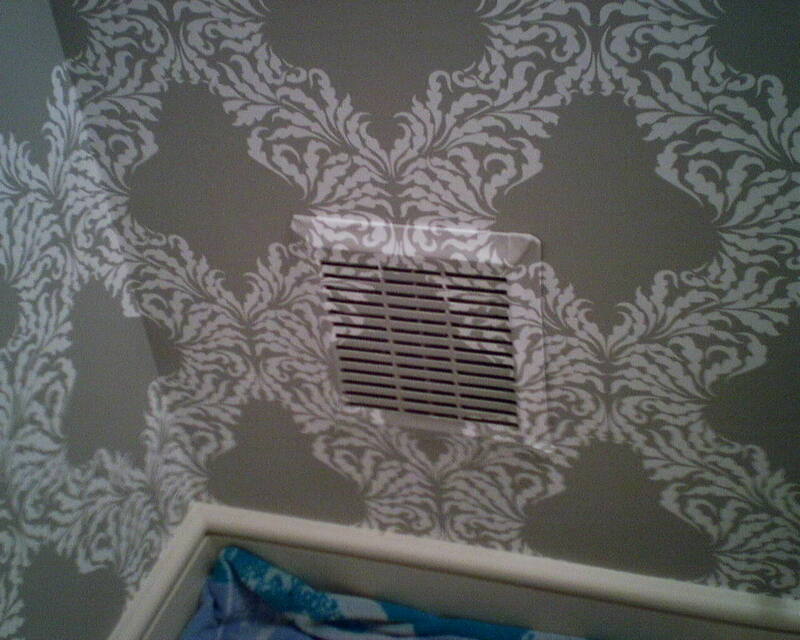 This happens mostly with pre-pasted paper-backed solid-vinyl wallpapers, and is a result of the wet backing trying to dry, but the moisture being trapped between the wall and the vinyl. Usually, small bubbles like those in the photo disappear as the paper dries. But sometimes, like with this paper, very large, even fist-sized air pockets will develop. So I always go back over the room a few times, chasing these bubbles out with my smoothing brush or squeegee. I usually recommend against these paper-backed solid-vinyl papers, and this is one reason why. Another reason is that, in humid rooms such as bathrooms, the backing tends to absorb moisture, which leads to curling at the seams, something that cannot be reglued or repaired. This is the second time I’ve hung this pattern in about 12 months. It looks like old maps and centuries-old buildings from Jolly Olde England. This week I hung this brown version in the potty room of a master bathroom in the Montrose neighborhood of Houston, and previously I hung a tan version in a master bathroom in the Tanglewood area. The wallpaper is by Thibaut Designs. 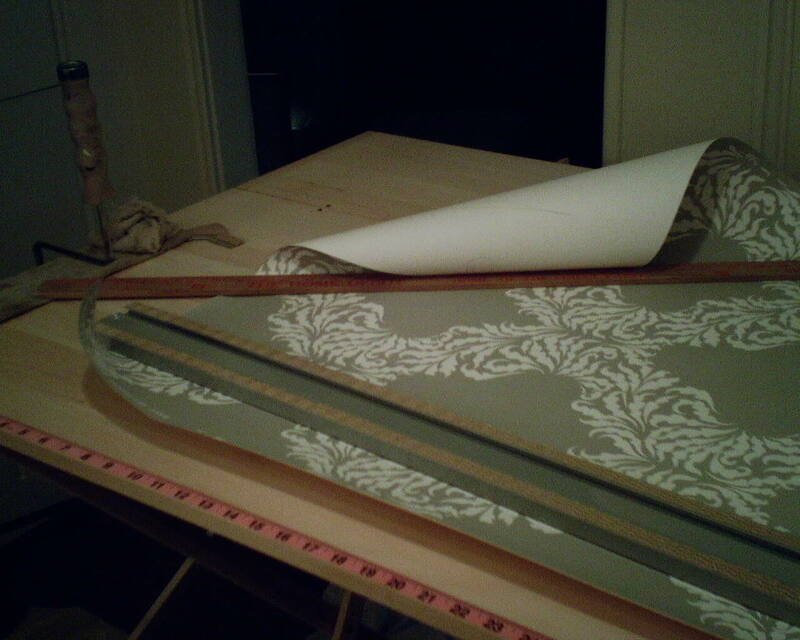 Here is a picture of my 6′ magnesium straightedge, used to trim wallpaper. A trimmer is no good if it slips, even a micro-nano of a millimeter. And metal coated with glossy paint is slick. So I went to the dollar store and got some non-slip shelf liner, trimmed it to fit the base of the straightedge, and used my favorite all-purpose adhesive, clear silicone caulk, to attach it to the straightedge. No slips = great straight cuts. This large scale medallion pattern in subdued tones went on a long dining room accent wall in the home of a newly-wed couple in Oak Forest (Houston). In the second photo, you can see that the motif has glitter, when the light hits it just right. This paper is on a non-woven backing, which is very durable and should peel off the wall in one piece, when it’s time to redecorate. I did two other rooms in the last two weeks in papers with glass beads. 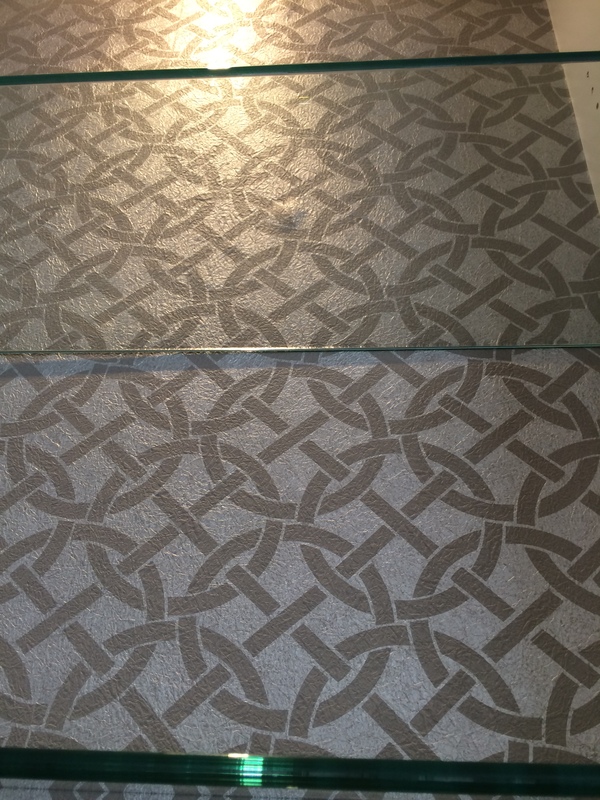 This paper is similar, but has no actual glass or sand components – it’s all synthetic. I have to say, I like this the best of the three. It was light weight, was easy to cut and did not dull my blades or ruin my scissors like cutting through the real glass beads. There were no tiny beads falling all over the client’s floor or getting behind the paper to cause pimples. I like the slight shading effect, too, in the medallions. But most impressive, I think this definitely had way more glitter and pizzaz, than either of the other two. Add a little side- or up-lighting, and that wall will really POP! The mottled brown wallpaper I am installing is going on an accent wall in a bedroom in the Montrose neighborhood of Houston. The other three walls are painted a strong gold color. 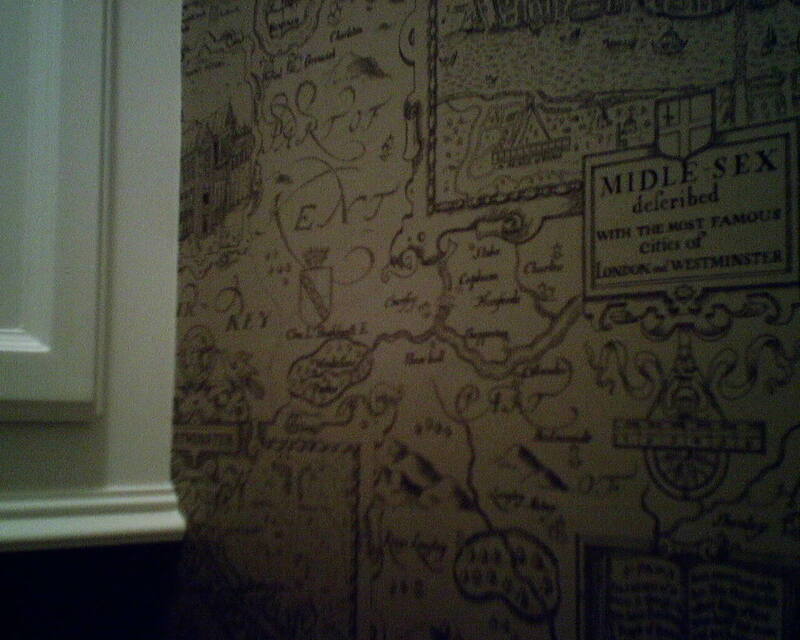 The back of the wallpaper has paste on it, and I don’t want to get paste smeared on the newly painted wall. Sure, I could wipe it off, but it’s better to not get paste on paint – especially flat paint – if possible, because it can leave a stain, or even cause the paint to crackle. So I used the Waxed Paper Trick. 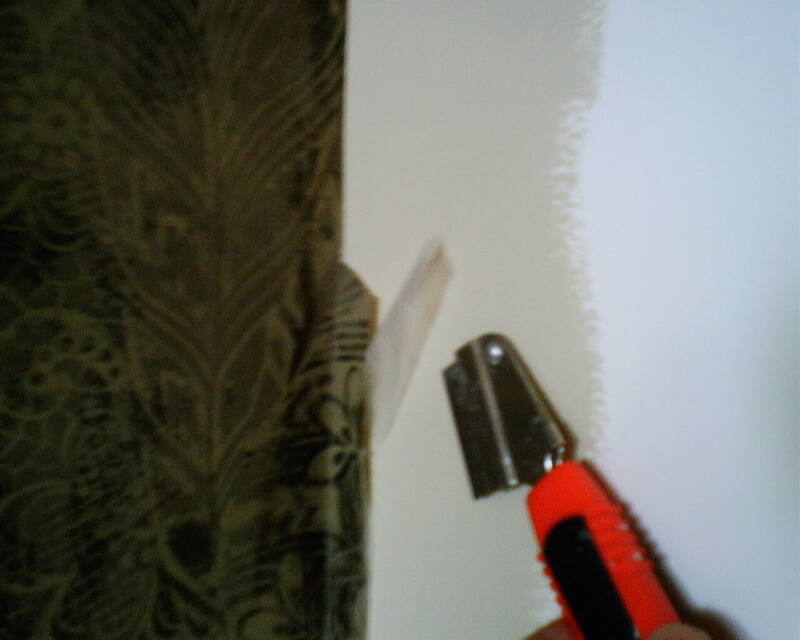 After the paper was pasted, I took some narrow strips of waxed paper and ran them along the edge of the wallpaper that was to end at the painted wall. I trimmed in the corner as usual, then removed the remnant of wallpaper, along with the waxed paper. Voilà! 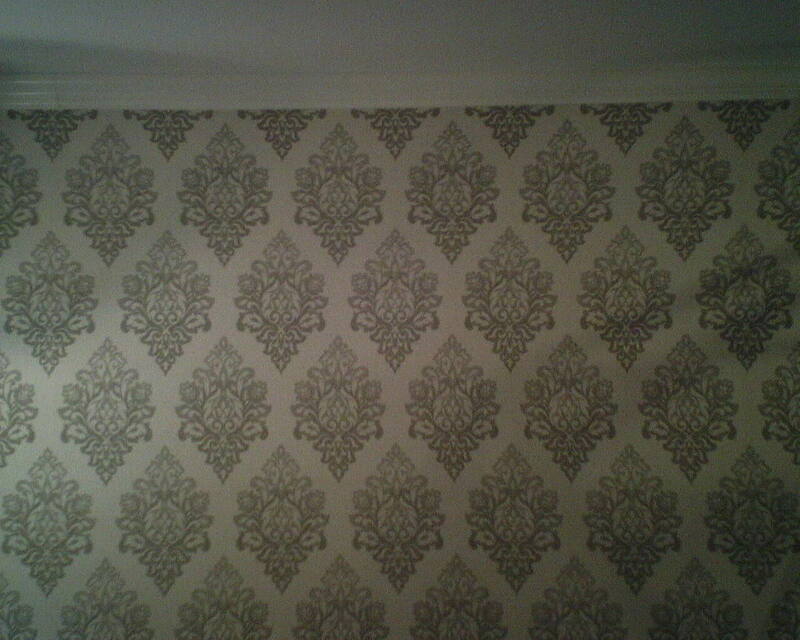 The wallpaper fit into the corner perfectly, and no paste got on the wall! Glass Bead Wallpaper – All the Rage Right Now! See all the sparkles? 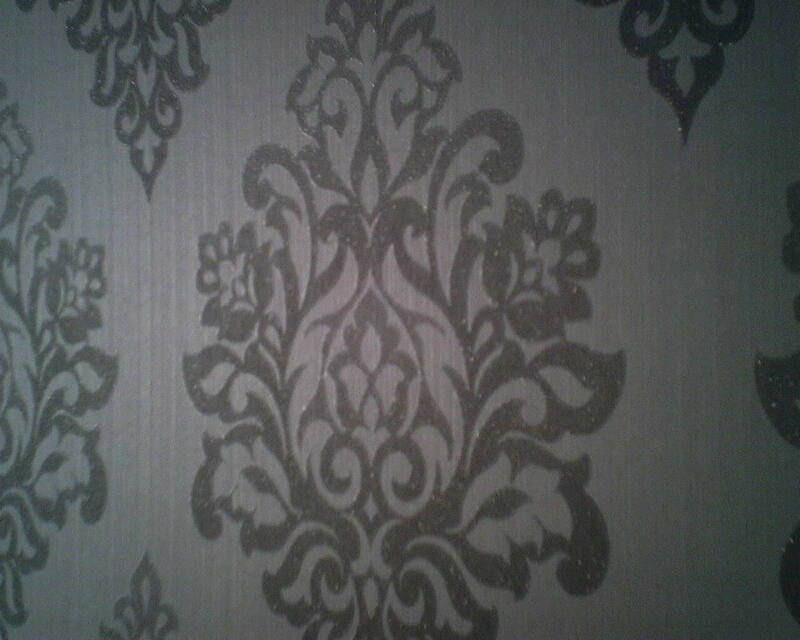 This wallpaper has actual teensy beads of glass forming the motif, so it’s three-dimensional, as well as sparkly. Some of these papers are made with actual (non sharp) glass, and others use sand. All of them are hell on my razor blades and scissors. 🙂 Virtually all use a thick non-woven material as a backing, so they are thick and the seams can show a little more than on thinner papers, but they also strip off the wall easily and in one piece when it’s time to redecorate. Also, n-w papers allow you the option of pasting the wall rather than the paper, which has advantages in certain cases. In all cases, you’d better be careful to not let any of those beads that come off the front get on the back or stuck in your paste, because they WILL show like a tiny pimple under the wallpaper. This went on a 12′ high TV wall in a new home in Montrose, and was a good choice, because it added texture and pizzazz, but did not compete with the main feature of the room – the large flat-screen TV. I suggested that the homeowners use some side lighting, or an up-light on the floor, to accentuate the glass beads and increase the sparkle / dazzle effect. Exhaust Cover… What Exhaust Cover?? The louvers on this vent cover had two levels, which made things a little more tricky, and a little less precise. But from a distance, the overall effect helps the cover fade into the background. I did this as a surprise for the homeowner, and she loved it. Why do I love this sink? Because it’s not there! 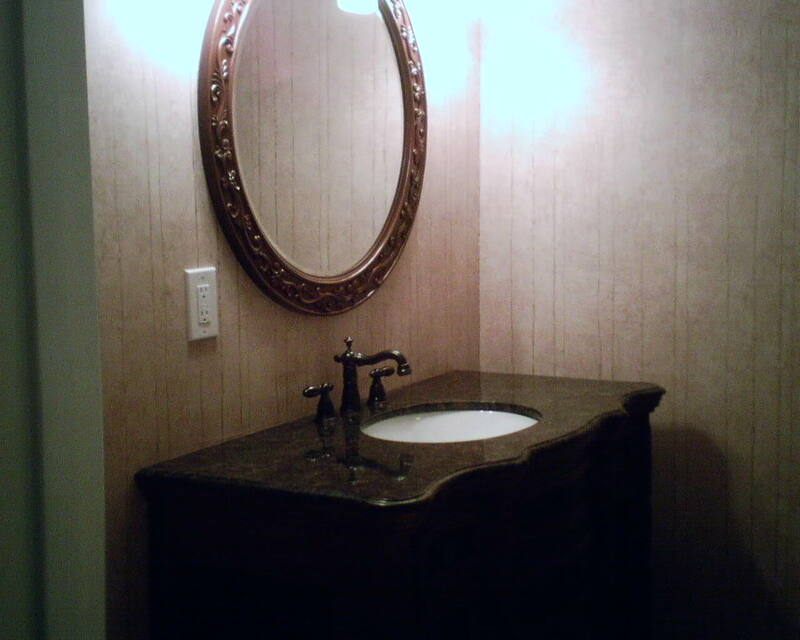 Pedestal sinks are the Devil to hang around, with tricky curves, the potential to tear wallpaper, and paste getting smeared all over the porcelain and faucets. I can spend a good half an hour or more, trimming around and under a pedestal sink. Heck, even nice, rectangular vanities can be a pain. So I was thrilled when this homeowner held off on the installation of her sink, so I could have easy access to the wall. It saved me lots of time, it got her better cuts around the plumbing, and it also means there are no cut edges along the top of the sink, so no worries about splashed water causing the paper to curl. 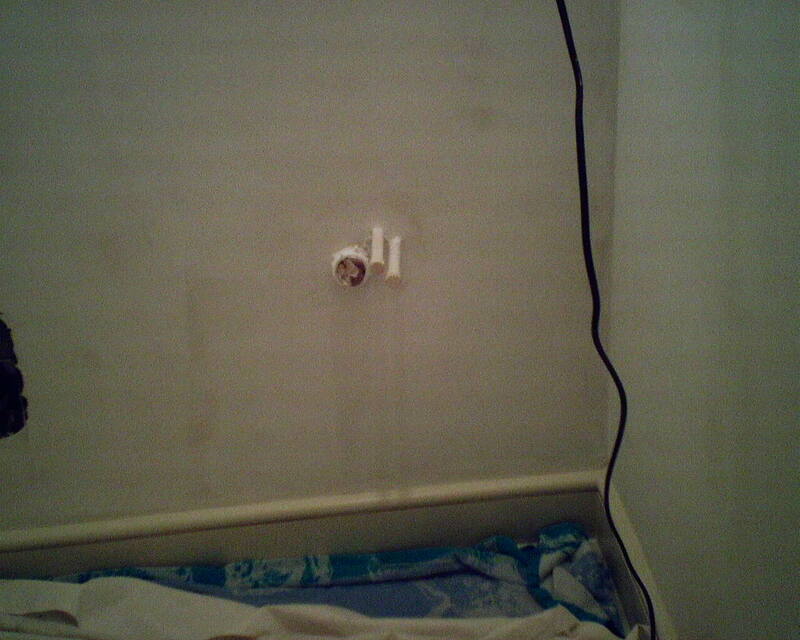 Now let’s just hope the plumbers don’t damage the wallpaper when they install the sink and toilet! Here is a textured and patterned heavy vinyl wallpaper on a non-woven backing that I put on the back of a set of bookshelves in the home of a young family in Bellaire. The interior designer was Pamela O’Brien, of Pamela Hope Designs. I did have some problems with bubbles developing in the material, but I smoothed them out, and everything was fine when I finished. But … a couple of weeks later, the designer’s secretary called to let me know that more bubbles had developed. I went over to the home today, to do what I could do to get rid of the bubbles. Bubbles like this are caused by “off-gassing,” which means that, as the paste dries and moisture evaporates, air gets trapped between the thick, impermeable vinyl wallcovering and the wall, which in this case was probably wood painted with an enamel or schellac based paint (as opposed to drywall coated with latex paint), with my primer on top of that. In other words, no where for the air to go. So all those air molecules gathered together and pushed up bubbles under the wallpaper. The representative from the wallpaper company said this in his reply to me, “I think you are right. 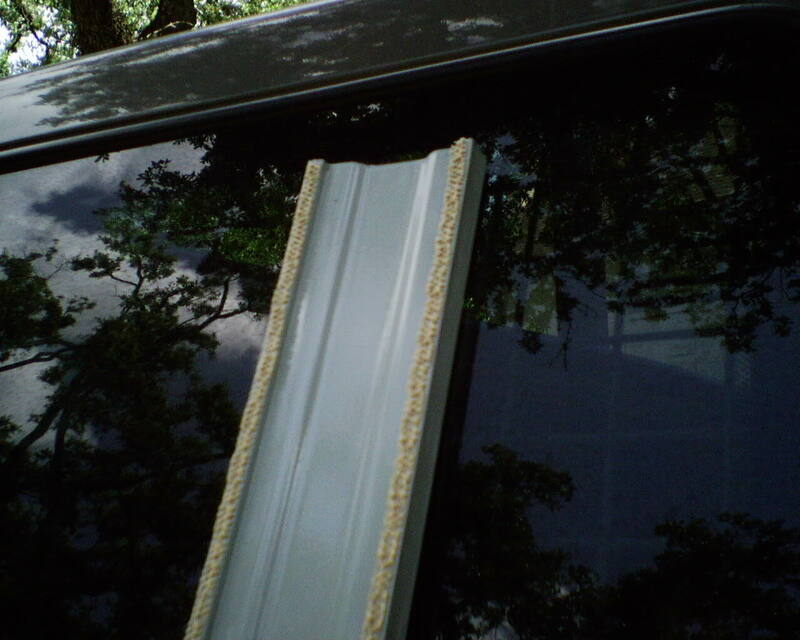 The surface you hung on looks like an enameled coated wood or particle board. In either case the surface could not absorb moisture, as regular wallboard would, so the moisture would have no where to go, being that the vinyl is impervious. Putting on wall liner might have given enough air space to circulate and dry. Bookcases are very hard to hang anything on because binding to a hard surface is always difficult and all the more with a commercial vinyl. OK, it’s good to know they are aware of the problem, and have developed a solution – a paper that “breathes” so as to allow the air to escape from the surface, rather than the back. But that didn’t help me much, since I still had to deal with this older version of the product, which was off-gassing from the back, and bubbling! I revisited the home today, almost a month after I originally hung the paper. A few bubbles were visible. (I suspect that some evaporated and flattened out during preceeding weeks.) I was surprised to see that there was still a lot of wet paste under the paper, yes, even four weeks after it hand been hung. With a solid wall surface behind it, and a solid vinyl surface on front, there was simply no where for the moisture to go. I was very happy that, for almost all of the bubbles, all I needed to do was prick a tiny hole and then push the air out. Since the paste was still active, the vinyl quickly stuck to the wall behind it. There was only one area where I had to cut a small slit in the paper and work some adhesive behind. When I left, it was all nice and flat, and it looked great. I do love it when I can get a little science lesson along with my wallpaper projects! These are smoothing brushes, used to press wallpaper against the wall, and to chase out bubbles or wrinkles. I usually use the one with the shorter bristles. But sometimes you need something that is softer and more suited for delicate papers. 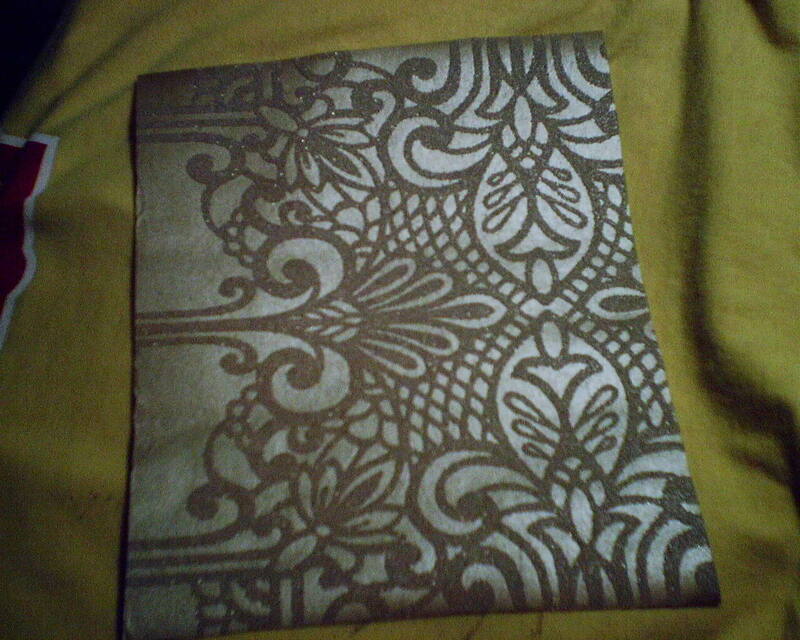 For hanging my authentic 1930’s wallpaper from Hannah’s Treasurers (do a Search – upper right hand corner), since the paper was so fragile, and since I was using a thinner wheat paste, a gentler touch was called for. So I used the longer bristled brush on the left. 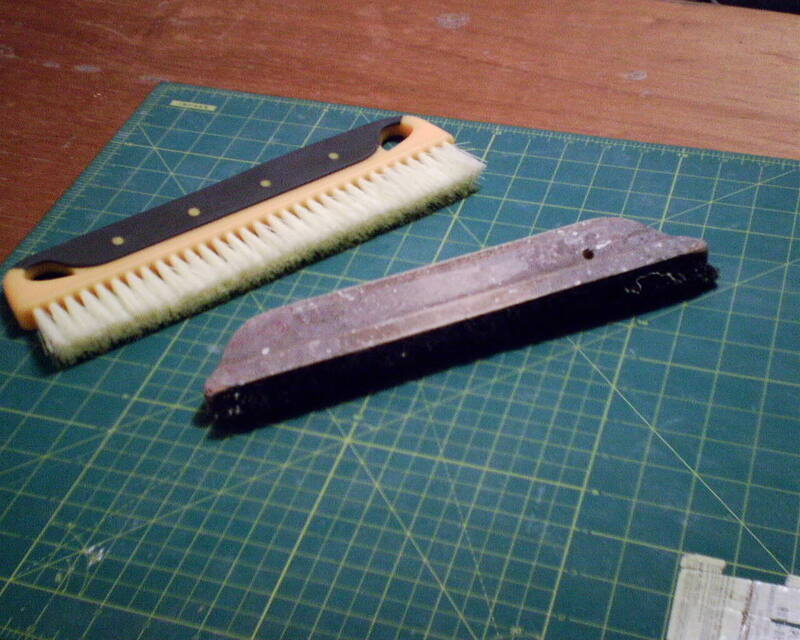 I also have one with even shorter bristles, in a stiffer material, which I use rarely, mostly for heavy vinyl material. 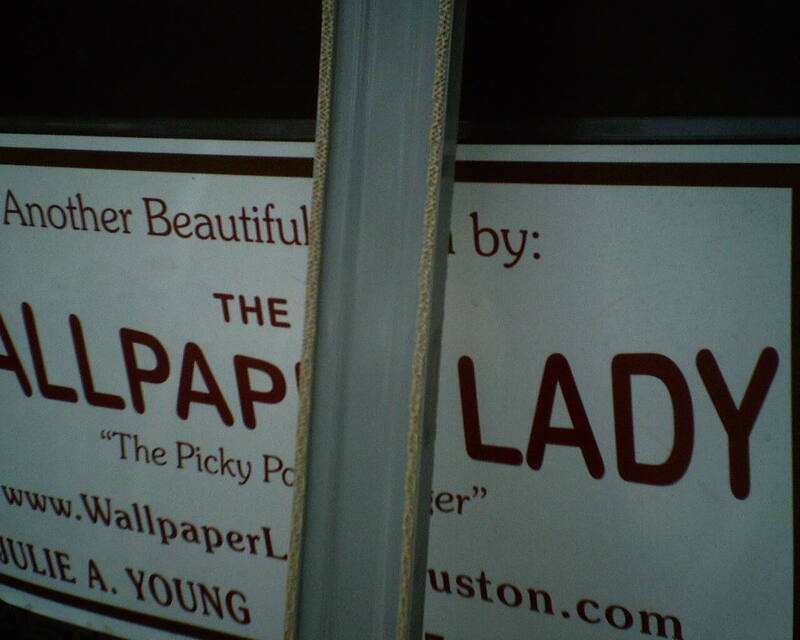 You are currently browsing the Wallpaperlady's Blog blog archives for June, 2014.